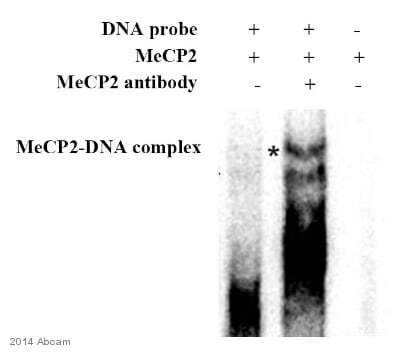 This antibody detects methyl CpG binding protein 2 (MeCP2). 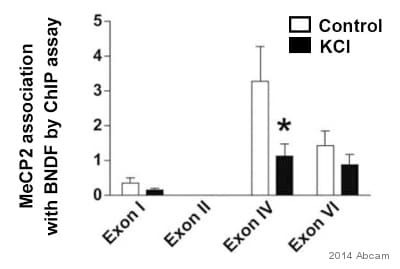 Synthetic peptide corresponding to Mouse MeCP2 aa 1-15. Our Abpromise guarantee covers the use of ab2828 in the following tested applications. WB Use at an assay dependent concentration. Detects a band of approximately 56 kDa (predicted molecular weight: 52.4 kDa).Can be blocked with Mouse MeCP2 peptide (ab4912). Recent lots of product ab2828 should detect the untruncated protein in human samples, 75 kDa band. Earlier lots detected the truncated version (55 kDa) in human and mouse samples. 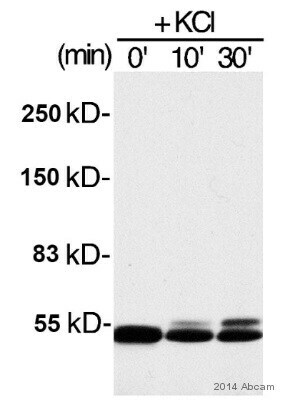 However in mouse samples, only a 55 kDa band is detected by all lots of the antibody. The difference between the earlier lots and the more recent lots is the antibodies were derived from different rabbits. Chromosomal protein that binds to methylated DNA. It can bind specifically to a single methyl-CpG pair. It is not influenced by sequences flanking the methyl-CpGs. Mediates transcriptional repression through interaction with histone deacetylase and the corepressor SIN3A. Present in all adult somatic tissues tested. Defects in MECP2 may be a cause of Angelman syndrome (AS) [MIM:105830]; also known as happy puppet syndrome. AS is a neurodevelopmental disorder characterized by severe mental retardation, absent speech, ataxia, sociable affect and dysmorphic facial features. AS and Rett syndrome have overlapping clinical features. Defects in MECP2 are the cause of mental retardation syndromic X-linked type 13 (MRXS13) [MIM:300055]. Mental retardation is a mental disorder characterized by significantly sub-average general intellectual functioning associated with impairments in adaptative behavior and manifested during the developmental period. MRXS13 patients manifest mental retardation associated with other variable features such as spasticity, episodes of manic depressive psychosis, increased tone and macroorchidism. Defects in MECP2 are the cause of Rett syndrome (RTT) [MIM:312750]. RTT is an X-linked dominant disease, it is a progressive neurologic developmental disorder and one of the most common causes of mental retardation in females. Patients appear to develop normally until 6 to 18 months of age, then gradually lose speech and purposeful hand movements and develop microcephaly, seizures, autism, ataxia, intermittent hyperventilation, and stereotypic hand movements. After initial regression, the condition stabilizes and patients usually survive into adulthood. Defects in MECP2 may be the cause of susceptibility autism X-linked type 3 (AUTSX3) [MIM:300496]. AUTSX3 is a pervasive developmental disorder (PDD), prototypically characterized by impairments in reciprocal social interaction and communication, restricted and stereotyped patterns of interests and activities, and the presence of developmental abnormalities by 3 years of age. Defects in MECP2 are the cause of encephalopathy neonatal severe due to MECP2 mutations (ENS-MECP2) [MIM:300673]. Note=The MECP2 gene is mutated in Rett syndrome, a severe neurodevelopmental disorder that almost always occurs in females. Although it was first thought that MECP2 mutations causing Rett syndrome were lethal in males, later reports identified a severe neonatal encephalopathy in surviving male sibs of patients with Rett syndrome. Additional reports have confirmed a severe phenotype in males with Rett syndrome-associated MECP2 mutations. Defects in MECP2 are the cause of mental retardation syndromic X-linked Lubs type (MRXSL) [MIM:300260]. Mental retardation is characterized by significantly below average general intellectual functioning associated with impairments in adaptative behavior and manifested during the developmental period. MRXSL patients manifest mental retardation associated with variable features. They include swallowing dysfunction and gastroesophageal reflux with secondary recurrent respiratory infections, hypotonia, mild myopathy and characteristic facies such as downslanting palpebral fissures, hypertelorism and a short nose with a low nasal bridge. Note=Increased dosage of MECP2 due to gene duplication appears to be responsible for the mental retardation phenotype. Contains 2 A.T hook DNA-binding domains. Phosphorylated on Ser-423 in brain upon synaptic activity, which attenuates its repressor activity and seems to regulate dendritic growth and spine maturation. Nucleus. Colocalized with methyl-CpG in the genome. Chromatin was prepared from U2OS cells according to the Abcam X-ChIP protocol. Cells were fixed with formaldehyde for 10 min. The ChIP was performed with 25 µg of chromatin, 5 µg of ab2828 (blue), and 20 µl of Protein A/G sepharose beads. No antibody was added to the beads control (yellow). The immunoprecipitated DNA was quantified by real time PCR (Taqman approach for active and inactive loci, Sybr green approach for heterochromatic loci). Primers and probes are located in the first kb of the transcribed region. Immunocytochemistry/Immunoflorescence of C2C12 cells labeling Methyl CpG Binding Protein 2 (green) with ab2828 at a dilution of 1/200. Cells with primary antibody (right) compared to negative control without primary antibody (left). Formalin-fixed cells were permeabilized with 0.1% Triton X-100 in TBS for 5-10 minutes and blocked with 3% BSA-PBS for 30 minutes at room temperature.Cells were probed with polyclonal antibody in 3% BSA-PBS and incubated overnight at 4°C in a humidified chamber. Cells were washed with PBST and incubated with a DyLight-conjugated secondary antibody in PBS at room temperature in the dark. Actin was stained using Alexa Fluor 554 (red) and nuclei were stained with Hoechst or DAPI (blue). Western blot using ab2828 on HeLa cells. Western blot using ab2828 on HeLa cells. Immunohistochemistry analysis of rat brain tissue staining MeCP2 with ab2828 (dilution 1/1000 in 3 % BSA-PBS). To expose target proteins, antigen retrieval was performed using 10mM sodium citrate (pH 6.0), microwaved for 8-15 min. Following antigen retrieval, tissues were blocked in 3% H2O2-methanol for 15 min at room temperature, washed with ddH2O and PBS, and then probed with ab2828 overnight at 4°C in a humidified chamber. Tissues were washed extensively in PBST and detection was performed using an HRP-conjugated secondary antibody followed by colorimetric detection using a DAB kit. Tissues were counterstained with hematoxylin and dehydrated with ethanol and xylene to prep for mounting. ab2828 staining MeCP2 (green) in mouse hippocampus CA1 tissue sections by Immunohistochemistry (PFA perfusion fixed frozen sections). Tissue samples were fixed by perfusion with paraformaldehyde, permeablized with 0.1% Triton X-100 and blocked with 3% serum for 30 minutes at 23°C. The sample was incubated with primary antibody (1/200 in PBS + 3% BSA + 0.1% Triton X-100) at 4°C for 12 hours. 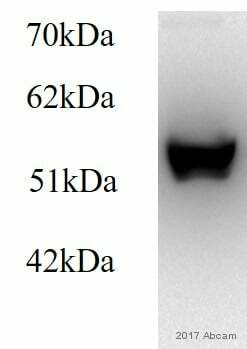 ab150077, an Alexa Fluor® 488-conjugated goat anti-rabbit IgG (H+L) polyclonal (1/1000) was used as the secondary antibody. 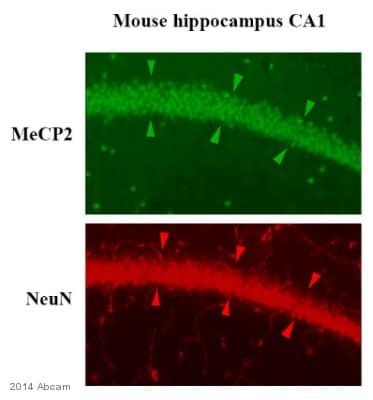 Counterstained neuronal marker mouse anti-NeuN (red).